Don't step on a crack or you will break your mother's back. Although I backdated the last two posts to when I planned to post them, those precious few of my reading friends know that I had not posted anything for over a month and not much before then either. Now I will tell you a bit about why that happened. First of all, we had a cool spring with few bugs and I tried to take advantage of it as much as possible, working in my gardens, buying pretty annual and biennial plants, planting and weeding, mixing in compose of bunny berries and worms. I have had a highly aggressive weed take over my herb garden the past couple of years that I have dug out several times and covered the soil with paper bags for months to kill it off but it has a root system that goes deep and spreads. I finally have given up on organic means and began to use chemicals on the ones in the foot path area where I have not planted herbs we would be eating. Maybe my Irish and Scottish mosses will come back in between the stepping stones....? In addition, we are in a drought so I have had to spend extra time and water on keeping my distressed plants thriving. My husband had to spend two weeks in the United Kingdom for training the first two weeks of June. A week before he left, I decided that I would begin redecorate the master bathroom. It has never been done since we moved here 19 years ago this September, but we have done some things along the way. For one, we changed out the light fixtures. Everything in this house was brass and I dislike brass, especially with a contemporary style, so the brass light fixtures were the first to go when I found bargain priced replacements that I liked with a dark rust faux look. Besides that, all the brass knobs and hinges are worn and discolored so I am quite happy to replace them. Two, we had bought metal ornament wall plates, hooks (rather than towel racks), other wall fixtures, and a wood curio cabinet years ago that all matched. They are all an off-white. I know it sounds like these two different colors will not work together, but they will when I have it completed. Now I have to say here that I have a problem when it comes to redecorating: I am the reverse Scotty of the original Star Trek. Scotty would tell the captain that whatever was wrong would take something like two weeks to fix, but somehow he would do it in two hours. Well, I have this idealistic dream that it will only take me two weeks to do a room and it always takes two months...at least, even working on it over eight to twelve hours a day most days. In my defense, the previous owner painted the walls with a sponged on faux technique. She did it poorly but I now understand why she chose it: It did a very good job at hiding all the unfinished detail work that builder left and the owner did not want to do, like little pock marks from bubbles in the plaster that were not plastered over and then sanded smooth. Whenever I do a room for the first time in this house, it takes far longer than it should because of things like this. When we took the wall paper off of walls in the room that now belong to the Princess, we found the plaster was rough and not sealed correctly so half way up the wall all the way around the room, the plaster had to be redone, finished, and sealed. So it goes, but later for details of the bathroom redo. I did get the wall for the light fixture painted with two coats and most of the sanding of the walls finished and the plaster dust cleaned up Saturday before my husband would be arriving home so that the bathroom was usable at least. I had called his mother that morning but she did not answer and she did not call back, which was odd. A bit later she sent out an email to a group of contacts that she had not been at her computer and probably would not be for a while as she had fallen on Wednesday and was in too much pain to move around much. My husband, of course, at that moment was still over the Atlantic Ocean and would not know this until we picked him up, most likely. Had she told us this on Wednesday, he could have changed his flight to check on her and I might have driven down and met him there—this was only one of the many more "had she just..." yet to be known to us. So, he called her that night and found she had been clipping some bushes and tripped over the garden edging when backing out. After the fall she was unable to get up so she crawled over to fence calling for her neighbor. The neighbor called the fire department because that is no charge, when an ambulance would be—the elderly on Medicare have this all figured out. The firemen got her on her feet and she felt a bit sore but okay. By Friday she was in so much pain that she would only sit and sleep in the recliner, use a walker to get to the bathroom and kitchen, and was not doing anything else. My husband suggested for her to ice the area. Had she just either gone into the emergency room or seen a doctor that day, she would probably not have drawn out what was going to be very painful days for her all alone. My husband did not plan to go see her and, in his defense, the long flight and time zone difference usually takes about two days to feel completely normal. So the next morning after he slept, I suggested we needed to go see her, but not to tell her we were coming. Instead of going to church we made arrangements with our housesitter, who thankfully was free until Thursday. My husband mowed the lawn and cleaned the rabbit cages while I took all the bathroom things back out of the guestroom, did laundry, and made our raw dog food mix to take with us. We all packed and left on Monday morning to drive to Florida with our dog along. The bad part was my husband was supposed to have Monday and Tuesday as comp days, but the office scheduled him to be an account on Tuesday and they could not change it, so he had to fly out on Tuesday morning and would not be returning until Wednesday late afternoon. I would have two days with his mother while she was in pain trying to convince her to get past her thinking she would be all right with a little rest and over her fear of finding out it was something more serious—which, being empathic, I already knew was the case. We gave her therapy with my frequency device that I have used for many years but she was not responding as would be typical of a misalignment of the spine at L1, which was the vertebra I knew had the problem. I kept urging her that if we went to a chiropractor that we could at least get x-rays to know what the injury was, at this point the injury was over a week old. She finally agreed and we took her to one that some friends of hers go to on Thursday. 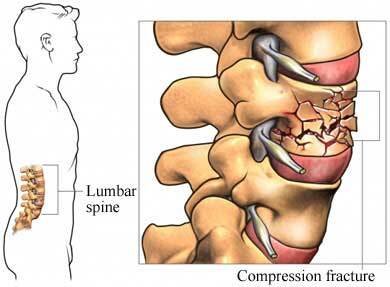 As soon as the chiropractor said he was concerned about a compression fracture, I knew that was exactly it. Next day, Friday, we returned for the findings and she definitely had a compression fracture at L1 and the intense pain she felt was caused by the instability of several microfractures. Now this is not a chiropractic issue, so we would have to find a doctor that performs vertebroplasty, which is an injection of a substance into the vertebra that "cements" the microfractures within fifteen minutes. The doctor they suggested was booked for three weeks and required that her primary doctor refer her. The problem there was her primary doctor is not in the office on Fridays but in the hospital in surgery, because he is actually a cardiology specialist and surgeon who had treated her husband for his heart condition. I called around a few places while praying. One said they were booked to September! However, that same one suggested another doctor who would most likely be able to see her much sooner. I called the number she gave me and answered that it was an imaging facility. I explained I was given this number for Dr. B. and she assured me I had the right place. Now I begin to explain the situation, the fall, we are in from out of state and cannot stay very long, her primary doctor is out of the office so he cannot refer her, etc. The first thing the lady said was no referral was necessary and she may be able to fit her in that day as the doctor was coming in for an emergency. So, within the hour we had forms filled out and MRIs where being taken. Mom was put as ease when they told us that her primary doctor and Dr. B. were very good friends. They would have done the procedure that day had it not been for the blood thinner medication, but it was scheduled for Monday morning. If ever there was a time that God moved mountains when we needed them moved, this certainly was one of those times, but we stressed to Mom that if she had been living closer to us, we would have had her in to be checked out immediately after the fall and we think it did scare her a bit as she is now at least considering moving. I had driven home on Saturday with the Princess and our dog because our housesitter had already started sitting at another client's house, but was returning to feed the cats and rabbits as well as water the plants. My husband hoped to stay the week but the office wanted him back and Mom was recuperating as expected so he flew out to North Carolina to work on Wednesday and flew home Friday. After the procedure, the worse of the pain would decrease immediately and Mom would not cause more damage with normal movements. Since beginning the bathroom redecoration, I was a bit more tired than usual, but this unplanned trip on top of it really wiped me out. I have been very tired ever since. In fact, I still cannot get my head wrapped around this only happened last week! Our vacation seems like it was six months ago and Mom's injury two months ago and we had been there weeks rather than just one. I am just plain worn out! My daughter left for a Christian youth camp for this week on Monday, my husband worked from home Monday and Tuesday but he is flying out this morning, and I need to begin planning our homeschool curriculum because I planned to start back into that after the camp, which may not happen as I hoped because I hoped to be further along with the bathroom before we started and then I have struggling with having physical and mental stamina to deal with just the normal daily stuff. However, my husband and I got a chiropractic adjustment yesterday and since I have been feeling a bit better. So with my husband east working and my daughter south at camp, I am now home all alone with my dog, cats, and the rabbits and that challenging unfinished bathroom—time to get back to work. My Lord, thank you for moving mountains for us to get Mom's injury treated and please bless her with a quick recovery. Also, my Lord, please restore me.